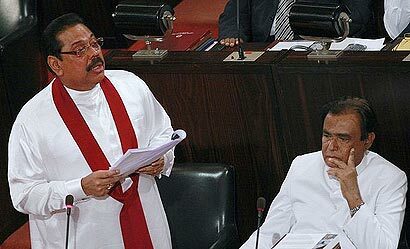 All Government servants and security forces basic salaries will be increased by 10%, President Mahinda Rajapaksa proposed delivering the 2012 Budget speech a short while ago. What matters is treasury money is spent for the benefit of the nation in economic growth ventures, infra-structure building, health, education, housing, agriculture etc and not on ‘buying’ more MPs to join UPFA with promises of various financial and material incentives. The huge UPFA Cabinet is totally unnecessary for a small country, to meet its demands. What a waste of money on these ministers! On winning the General Election this time by more than 2/3rd majority, the President should have pruned the size of the cabinet for a task force of efficient, capable ministers who would deliver the goods. Instead, he increased the cabinet size to please everyone. What a burden to the public purse! This money would have been better spent on good causes for the nation.